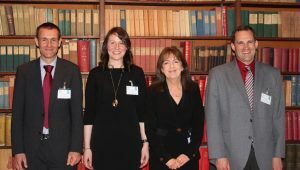 The Irish Meteorological Society (IMS) in conjunction with Met Éireann, held an event called “The Wind that Shakes the Island: an Irish perspective on Windstorms and Hurricanes” in the RDS in Dublin on the 13th of April. It was an evening event held in the Concert Hall of the RDS and with thanks to sponsorship by the Environmental Protection Agency (EPA). With Ophelia still fresh in our memories, this event provided an overview of the importance of all of the factors that contribute towards minimising loss of life and damage to property during this kind of extreme weather phenomena: accurate forecasting, reliable observations, international cooperation, a sound understanding of past climate variability and ultimately emergency coordination and a prepared population. Declan Murphy, president of the IMS, welcomed the attendees and gave the floor to the panel of experts who shared their knowledge on windstorms with a very engaged audience in a most interesting evening.The first talk was by Evelyn Cusack, a forecaster with over 30 years of experience, a familiar face across Ireland and the current Head of the Forecasting Division in Met Éireann. She spoke about storm-naming initiatives in Europe and the US, with an emphasis on the joint efforts by the UK and Ireland Storm-naming has helped raise awareness among the public of the risk of significant events and has helped the dissemination of accurate information between met services, the media and the general public. The second talk of the evening was by Liz Walsh, also from Met Éireann’s Forecasting division. Liz worked as a forecaster in the national meteorological service of New Zealand for five years until 2014 and as a meteorologist in SSE Plc in the UK before returning to Ireland in 2016. She gave a very informative talk about the differences between tropical and mid-latitude storms before providing an engaging and detailed account of the work in the Forecasting division in the days preceding and during storm Ophelia. Met Éireann’s choir, the Isobars, conducted by Aoife Murray and accompanied by Dónal Black, livened up the room with a windstorm rock medley and the oriental rhythms of “Here comes the Sun” by The Beatles. After the musical break, Professor Len Shaffrey, of the National Centre for Atmospheric Science (NCAS) and the University of Reading in the UK, talked about past and future variability of storms. Professor Shaffrey is an expert on extratropical cyclones, decadal climate prediction and climate modelling. He introduced two European projects, Windsurfer and Eupheme, which both the University of Reading and Met Éireann are currently collaborating on with other European research institutions. 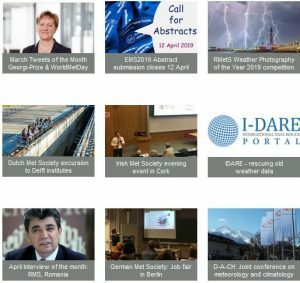 The projects, respectively, have the aim of producing new methods to assess the current and future risks of extreme winds and waves in Europe, and to attribute observed extreme events to global climate change. 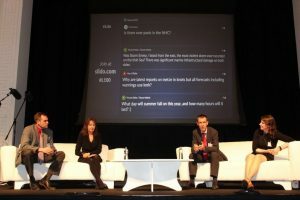 He also highlighted efforts made in the UK to use citizen science to assist with historical data rescue to understand how storms have varied in the past (www.weatherrescue.org), the fact that some decades on record are stormier than others and the uncertainty on how climate change will affect the likelihood of events like Ophelia. The second international speaker was Dr. Mike Brennan, Branch Chief of the Hurricane Specialist Unit at NOAA’s National Hurricane Center (NHC) in Miami. Dr. Brennan spoke about the important work of the NHC in tracking and forecasting hurricanes, naming them, informing Met Services and issuing warnings. He underlined that the biggest threats to human life associated with hurricanes are those related to water, namely, storm surge, heavy rainfall and subsequent flooding. The NHC carries out substantial outreach activities outside the hurricane season; raising awareness amongst vulnerable communities, having clear and well communicated evacuation plans and a population that is storm-ready is what ultimately saves lives in the regions affected by major hurricanes. The evening ended with very interesting questions from the audience answered by the panel of experts and a thank you and wrap up by Met Éireann’s director Eoin Moran.